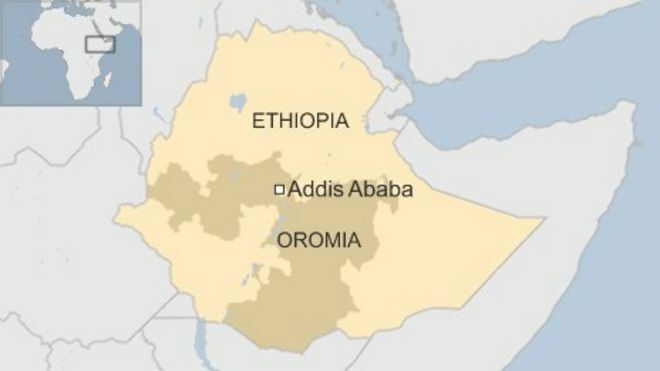 Several people have been killed in a stampede in Ethiopia’s Oromia region after police fired tear gas and warning shots to disperse a protest. Thousands were gathered for a religious festival in Bishoftu, 40km (25 miles) from the capital Addis Ababa. Officials responded after anti-government protestors threw stones and bottles, reports said. There was panic and some people fell into a ditch. There have been months of deadly clashes in Ethiopia in recent months. People in the Oromia and Amhara regions have complained about political and economic marginalisation. The unrest was sparked last November by a plan to expand the capital into Oromia. This led to fears that farmers from the Oromo ethnic group, the largest in Ethiopia, would be displaced.